Instead, the Senate is pushing the fairness issue, implying it’s not fair that states are losing sales tax money due to untaxed Internet sales. [3:32] Luke Johnson, philosophy Ph. D. candidate at the University of Georgia says "Everyone walks around talking about justice and philosophy as if they know what they are… that does seem to be at work in the Marketplace Fairness Act." However, opponents point out that sales tax in physical stores theoretically supports the road and infrastructure that allow the store to exist. So then, why would the Internet need sales tax?, they ask. To hear an answer to that question, listen to our story about when and which taxes are fair. It may get you thinking. Subscribe to this podcast on iTunes or Stitcher. And listen to CNN Soundwaves on our SoundCloud page. Here comes another tax burden on the American people. This will be a burden on internet retailers as well. All the states with sales taxes and the counties that have high sales taxes than the states. This is to much and can shut down businesses and kill jobs. Besides the money we spend has already been taxed once before when we made it. We are getting taxed twice on our incomes and that is wrong. Another tax burden on the American public. With millions of people unemployed, creating more taxes on the majority of the middle class that buys merchandise thru the internet, is not just wrong, it is criminal. What will all these taxes collected be used for? I guess President Karzai in Afghanistan needs us to pay him more American money. So called democracy at work. The rich Senators probably have never bought any items over the internet. Again, graft, greed, and corruption win out over free enterprise and the American way. I'm a democrat, but I agree with you. I'm 100% against this Fairness Act b.s. What us middle class people need to do is push back. )(In reality, this won't happen.) -> Just stop buying over the internet. Force these online businesses to push back. If we stop buying, they'll lose money. 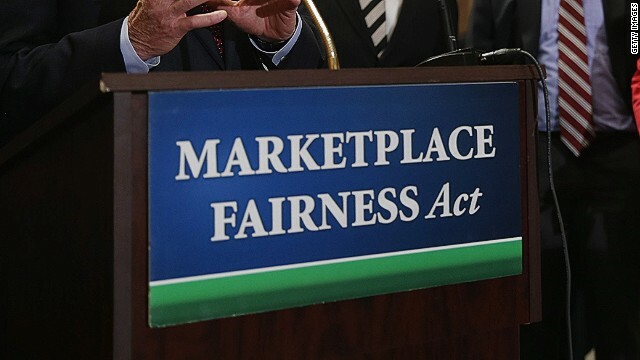 Online businesses losing money would definitely put pressure on them and the Senate for approving this so called Fairness Act. NO NEW REVENUE!!! CUT GOVENRMENT SPENDING!!!! CUT WAR SPENDING!!!! BRING OUR TROOPS HOME!!!! STOP GIVING OTHER COUNTRIES FINANCIAL ASSISTANCE!!!!! I don't mind paying taxes as long as the taxes are balanced and fair and apply to everyone earning more than below the minimum threshold for poverty. However, an internet tax... who receives the tax? The state/country that the sale was made or the state/country where the product is being sold from? i.e. if I live in Washington and buy an item online from Florida, who receives the tax? How is that tax apportioned to the state in question? If I purchase an item online from Japan, the UK or what have you, who gets the tax then? And what about virtual items as opposed to physical items? It seems that there are going to be a LOT of questions revolving around this for some time to come. II will take your bait. Here is the equally stupid flip-side of the same coin of your post. Of course this is fair. People have to pay sales tax when they buy something at a store, so it is ridiculous to say they shouldn't have to when it is bought over the internet. Some say this will hurt the industry because of shipping, but the shipping cost could be subtracted from the sales tax for items over $75, and items under it will have to pay a smaller sales tax. So, a small online retailer in Illinois who makes $1 million a year in interstate sales will need to pay sales tax for their customers in New York. What's the problem with this? Well, the business in Illinois is able to vote the politicians in Illinois out of office if they are unhappy with the way the state is handling taxes or what have you. However, the politicians in New York have absolutely no accountability for the business in Illinois. And the business has no recourse against said politicians. So...isn't this taxation without representation? The way it would work if this bill became law is that the online seller would be responsible for COLLECTING state sales tax from the consumer, then remitting it to the state in which that consumer resides and purchased the goods. The burden of sales tax will be solely placed on the consumer, based on the state in which that consumer lives. For example, if you live in Arkansas, and you purchase something from Amazon, Amazon must charge you for Arkansas sales tax, and then remit that sales tax back to Arkansas Department of Revenue either on a monthly, quarterly, or annual basis. If you do not like the Arkansas sales tax, you can, as a citizen of the state, get in touch with your state representatives, petition your state government for a change in state tax policy, vote accordingly, etc. ; therefore, the issue of "taxation without representation" is not presented by this proposed legislation. The burden on the online businesses will be an administrative one, though there are provisions in the bill which address this, requiring that states who wish to take advantage of this opportunity (states will be able to decide on their own to require online businesses to collect and remit tax for purchases which occur within their respective states; they do not need to require this) simplify their tax codes and implement a computerized reporting system (presumably online capability) with which online sellers who earn over $1M annually will be able to, with some ease, determine at the end of a reporting period how much was collected from buyers of that state and how much is due to be remitted back to the state. Although I do see the trouble that states, 20% of whose revenue comes from state sales taxes, have encountered in light of increasingly prevalent online shopping trends, and subsequent reductions in volume of in-store purchases, I am not suggesting whether or not I agree with this, as I have not yet decided how I feel about it either. Rather, I have looked at the bill a bit and just thought I would try and help to provide a little perspective as to how it is intended to work. "However, opponents point out that sales tax in physical stores theoretically supports the road and infrastructure that allow the store to exist. So then, why would the Internet need sales tax?, they ask." To support the road and infrastructure that allow the store to deliver your goods to you. Such a tax is a violation of our President's promise to not raise taxes in any way on 98% of Americans. Of course the ACA already violates that promise. Get a clue. This is not a federal tax, it's a state tax. The POTUS has no control over state taxes. If you have a gripe, take it up w/your state. You Obama haters really should seek a mental health pro. Next tax will be the air we breath. Republicans keep saying they hate taxes, no more taxes, but guess what. They pass big tax bills in Republican controlled states all the time. Republicans are the Robin hood stealing from the poor and giving to the rich. Anyone who makes the argument that internet purchases should pay taxes meant to support the roads and local infrastructure that would support traditional brick-and-mortars forgets that all internet purchases (except digital downloads) are still shipped on those roads and infrastructure. Digital download taxes could, though, go towards paying for better information instructure in towns and rural areas which can then be 'rented' to providers to provide people with higher quality services and re-introduce the idea of competition between local providers. This bill will hurt the rural population the most. Shipping & Handling often cost more than the product itself. Which is also taxable in many states, so now those people are supposed to pay an added expense. Many will just drive into the cities, which adds to waste of gasoline, driving up its cost and environmental costs. This is a no win situation. And what keeps you from comparing internet prices ? If a product is under a $100 it will be cheaper buying it from the source, even as far as Hon Kong. Maybe overseas stores will benefit if a consumer is smart & shrewd enough. Of course it's fair. It puts local businesses on an even playing field and affords states much needed extra revenue. It'll cost all of us more who order bargains online, but those online businesses should not have an advantage over local businesses. I'm not sure how they come up with the figures but I received a thing in the mail this year about stuff I ordered from Amazon and 70 dollars in taxes that I didn't have to put on my income tax unless I wanted to. I didn't, of course. Not sure how they based it....I only bought a few movies. Anyway....if this law passes.....I will curb my spending online as I'm sure many others will as well. Your comment is why I am surprised Amazon supported this tax. My buying habits have already changed; the only reason I bought from Amazon, typically, is because of having saved money. With Amazon charging tax, where is the incentive of buying online? Larger selection, no need to leave your house and waste fuel driving to multiple stores. Don't forget Amazon is usually cheaper base prices, so you would be paying less for the product and less sales tax in the end. You still win shopping online. Steve, unless you are doing at least $1 million in sales, you are exempt. If you look at online retail net margins.... 1 million in sales is tiny... A handful of employees at best could be supported by a business that size. Since I both buy and sell on the internet, and DO REPORT my purchases on my state income tax form like Missouri law requires, I'd prefer it is collected at the time of sale. There will be software to make the tax reports on for sellers, probably provided free. I already have free MO software for my in state sales. This is not rocket science. To be fair, if a brick and mortar business offers the same products as an online company, then they should start their own online site and sell in 49 other States and around the world to level the playing field. Broaden their marketplace have more business instead of stifling other business with needless paperwork. The States are desperate for more money, and they can just vote and make your money theirs. Why don't we pass a bill saying any item purchased online is not allowed to be shipped via public roads paid for with sales tax dollars? I'm a small business owner who will be negatively impacted by this bill. It will be a significant amount of wasted effort to comply with the sales tax in hundreds of different tax jurisdictions. The states are supposed to provide "free software" to allow us to submit sales tax to them. However that will be a nightmare in and of itself. Think about your income tax forms... guess what, they are free too... just think about how easy it would be to fill out maybe 4 dozen of those income tax forms every month. Steve, Just as you view this as unfair, so does the family that owns the small corner shop. They have to pay sales tax. They already do everything you complain about having to do. How is this unfair to you, when you already hold an advantage over another business? This is not a bill to support the local corner shop however it's proponents might be trying to sell it. This supports Walmart, Best Buy, and Amazon (who is putting a physical presence in every state) and that is why they are strongly backing the bill and paying for the lobbyists. Large corporations can easily comply with the paperwork burden, small businesses cannot. The fairness of an online tax is subject to debate. However the compliance nightmare is not debatable. It will hurt small business. Make compliance easier – then we can talk about what is or isn't fair.